Last edited by fantomas on Mon Jul 09, 2018 9:05 am, edited 2 times in total. Changing the script to 1C worked. Thanks! [USER=1587]@fantomas[/USER] can you share new ct that you uploaded before to me? Can you please help me! I've downloaded your most recent table and the 2 that came before it. My game version is 7.0.99576 so I dont understand why none of the tables work with my game. 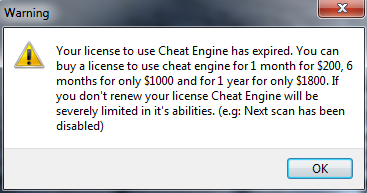 I can't activate any cheats at all! I can click the scripts and the pointers box, but that's as far as it goes. I don't really know a lot about CE if I'm being honest. All help is appreciated! Last edited by Tr33Hugger on Mon Jul 16, 2018 8:57 pm, edited 3 times in total. No I know the basics to allow me to actually use the application ? I use it for every game I download, I've never used a table before though or memory view, so I've spent the last 2 days trying to learn how to use it - and I think I did okay. I just still don't understand why I can't activate any of the cheats. If you could even just point me in the right direction (besides tutorials) it'd be great. Okay so me not knowing how to use cheat engine was not the problem at all, nor was your table.... me having common sense though... ? Turns out I just needed to update CE ? Sorry about that! ? Last edited by Tr33Hugger on Mon Jul 16, 2018 10:53 pm, edited 3 times in total. I have no idea what I'm doing wrong. I cannot get SetNPCRelationship to enable at all. I've followed the directions to A T, I replaced the script with the modified 1C and I still can't get it to work.